When it comes to accidents involving large trucks, one day of the week stands out from the rest in terms of when the crashes are most likely to happen. According to the Insurance Institute for Highway Safety, accidents involving large trucks are more likely to occur on Thursdays. In this issue, we’ll look at their study and discuss why Thursdays are so dangerous. While its true that accidents involving intoxicated drivers in automobiles tend to increase on Fridays and Saturdays, drivers of large trucks are less likely to be on the road during the weekends. In looking at data from 2015, the study found that Thursdays is by far the most dangerous for truckers, many of who are fighting fatigue as they prepare to close out the week. It was also found that accidents involving large trucks are more likely to happen between 6 a.m. – 3 p.m., and least likely to happen from 6 p.m. – 3 a.m.
Where are large truck accidents more likely to happen? The study found that over half of fatal accidents involving large trucks happen on major roads other than highways or interstates. How can I reduce my chances of being in a wreck with a large truck? While we shared these tips in a previous blog entry, they’re certainly worth repeating here. Stay out of their blind spots. Because of the size of their trucks (usually 70-80 feet), truckers have very limited visibility on either side of their rig. Along each side of the truck – particularly the right side. If you’re going to pass, don’t hesitate. Always pass on the truck’s left side. Even if you’re using cruise control, do not try to keep pace with the truck; pass it quickly. Don’t cut too closely in front. Because the height of the truck cab (where the driver sits) is so steep, the trucker may not be able to see you. Also, the trucker needs more time and distance than you in order to stop. Keep your distance when following from behind. It’s best to maintain a safe distance between your vehicle and other drivers. In the case of large trucks, try to maintain a four (4) second distance. 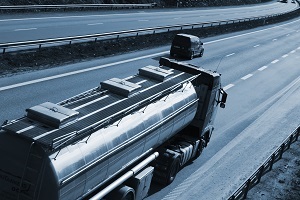 If the trucker isn’t aware of where you are, you could rear-end the truck if a sudden stop or adjustment has to be made. When you’re behind or near a large truck, refrain from any phone use. Distracted driving is dangerous enough. It’s even more dangerous when you’re in such close proximity of a large truck. Instead, call the experts here at Barber & Associates. The first consultation is always free, and you can reach us at 907-276-5858 or through email.